Cook County Sheriff Tom Dart told reporters Wednesday that he isn’t ruling out a run for Chicago mayor and would base his decision, in part, on two factors. "Everything is a possibility, I'm definitely not saying no,” Dart said. “But, if I take an office, I want to know I will still have time for my family and be able to make a difference." Dart assumed the office of Cook County sheriff in 2007. Prior to that he served in both the Illinois Senate and Illinois House of Representatives. 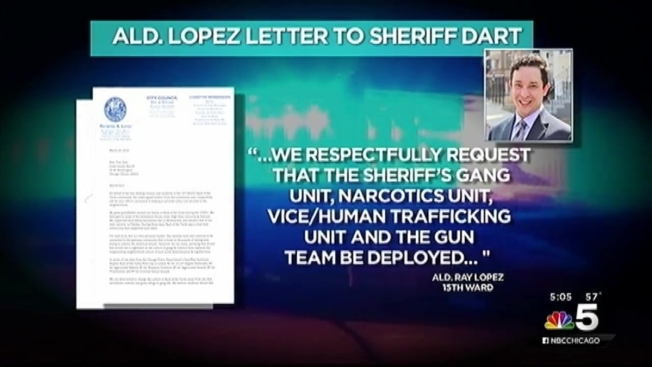 Dart's recent comments were made while announcing his plan to add officers from the sheriff’s department to the Back of the Yards neighborhood to curb crime. The neighborhood has been reeling from gang violence, and Dart claimed that in roughly two weeks 100 sheriffs will be allocated to the neighborhood. In addition to this, he plans to meet with the Chicago Police Department to coordinate patrol areas. Dart declined to be a candidate in Chicago’s 2011 mayoral election. Mayor Rahm Emanuel ultimately won the election in a rout. “This isn’t about me, it’s about fixing something,” Dart added. He has recently held two out-of-town fundraisers, which will be covered in Friday’s edition of Deep Dish at 4:45 p.m. on NBC Chicago.